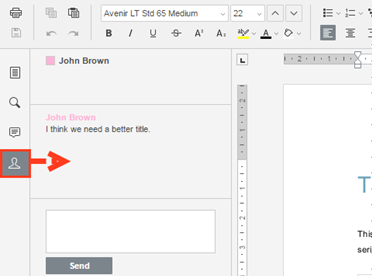 Collaborative Web Editing is Here! You asked, we delivered: nDrive - new and enhanced features! You asked, we delivered! nDrive - New and enhanced features! 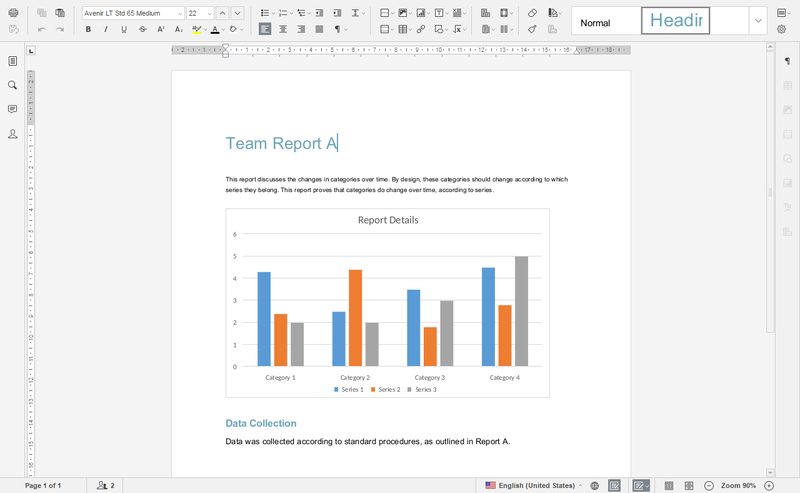 With the real-time Collaborative Web Editor, you can edit documents, spreadsheets, and presentations when working in the web portal, without needing to download a separate application or navigate away from the system. 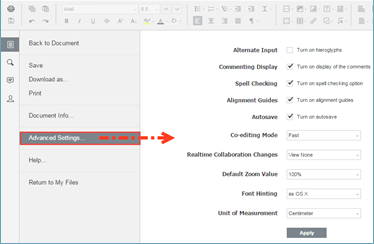 Additionally, the Collaborative Web Editor allows you to make these changes simultaneously with multiple coauthors, and lets you see each edit in real time. 1. 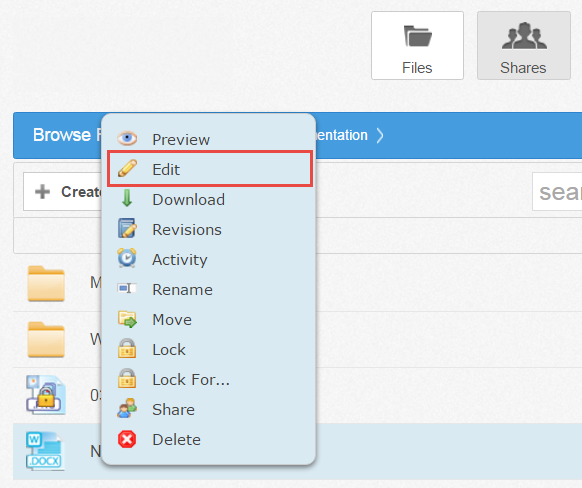 In the Files tab of the web portal, navigate to the file that you want to edit. 2. Right-click the file and select Edit. 3. The file opens in the fully integrated, real-time Collaborative Web Editor. 4. To configure advanced settings, click the Manage button. 5. The left-hand navigation bar expands. 6. In the left-hand navigation bar, click the Advanced Settings link to turn on and off features, such as commenting, spell check, auto-save, and so forth. You can also choose to view or disable real-time collaboration changes. 8. Click Save to save the file. 9. Click Save as to save the file with a new name. 10. 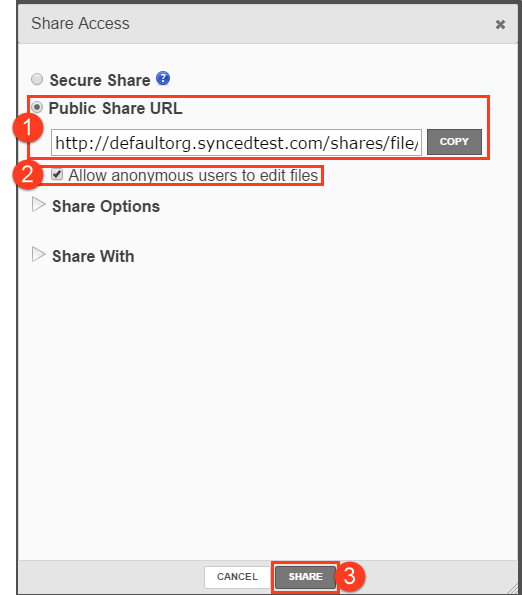 Click Share Link to generate a share link for a standard user or guest user. The recipient will be given privileges to co-edit the document using the Collaborative Web Editor. 11. Click Download as to download the file to your local machine. You will be presented with the option to download the file in your preferred file format. 12. Click Print to print the document using your preferred printing device. 13. Click Help to view a comprehensive listing of all available functionality. 14. 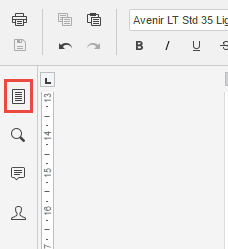 Click the Back to Document link to collapse the left-hand navigation menu. 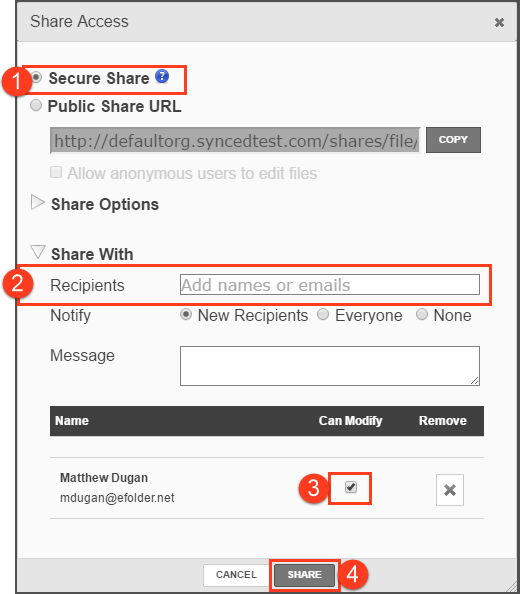 To collaborate on a single file in real time, you can create a share link from the web portal or your desktop client. 1. Click the File tab and select Share Link. 2. The Share Access dialog box displays. 4. Select the Public Share URL radio button, and then click the Copy button to ensure that you capture the URL of the file. 5. 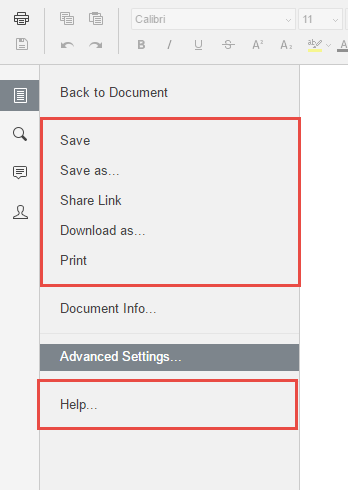 Select the Allow anonymous users to edit files checkbox to let anyone who launches the share link to edit the file using the Collaborative Web Editor. 6. Click the Share button to save your settings. You will then be able to paste the share link in an email, chat, or other messaging device. 8. Select the Secure Share radio button. 9. In the Recipients field, enter the name of the coauthor. The name of this new user will display in the lower portion of the screen. 10. Ensure the Can Modify checkbox is selected. The Can Modify permission allows this user to edit the file. 11. In the Share Options section, select Secure Share. 12. 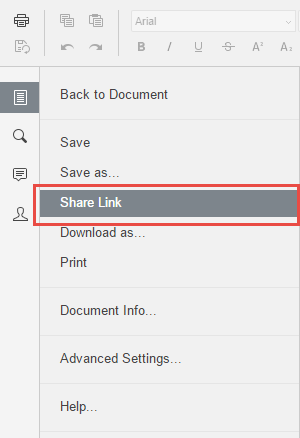 Click the Share button to send the share invitation to the recipient(s). 13. To view a list of coauthors who are actively editing the file, click the View Users button. 14. 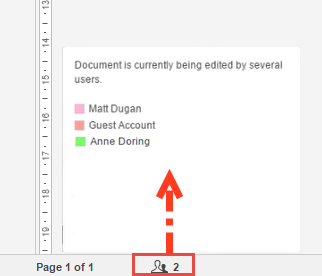 When these users make changes, their edits are visible immediately and are marked with a vertical bar. 15. Hover over the vertical bar to view editing details. 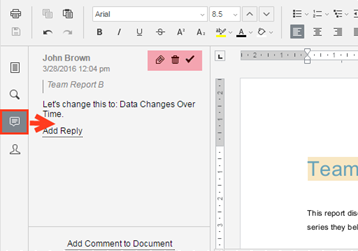 When you are collaborating on a document in real time, you can use the Chat feature to communicate and share ideas with coauthors. 1. In the left-hand navigation bar, click the Chat button to reveal the chat window. 2. Enter your message in the Chat dialog box and click the Send button. A visual overlay displays over the recipient’s Chat button, indicating that a new message is available to view. 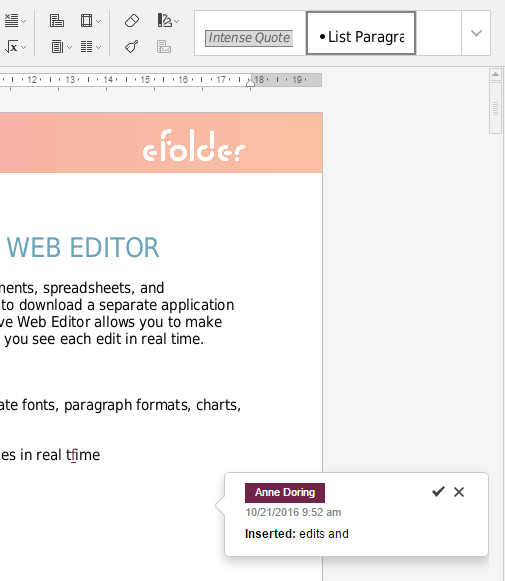 The Collaborative Web Editor allows you to edit using its Track Changes feature. You can also embed comments into files to aid in the collaboration process. Note: If the file is later downloaded and opened on a local machine, these edits and comments will remain, and will display in all applications that support Track Changes and commenting (for example, Microsoft Office products). 1. To turn on Track Changes, click the Track Changes button found at the bottom right-hand corner of the screen. 2. All changes made by you and coauthors will display in bubbles, allowing other users to accept or reject these changes. 3. To add a comment, highlight the appropriate portion of the file, right-click the highlighted content, and then select Add Comment. 4. A pop-up bubble displays, allowing you to type a comment. 5. 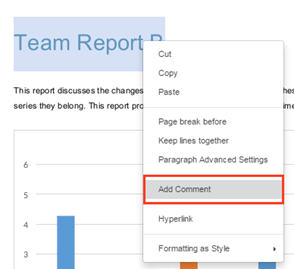 To view all comments in the document, or to respond to an existing comment, click the Comments button in the left-hand navigation bar. You can use the toolbar to edit, delete, or mark a comment as resolved. Want to lean more or need help getting started? Contact our team!